Change your Windows background picture every time you start your computer, or with the click of a shortcut. You can select a folder to display images from and even include sub folders so all nested images shown as well. 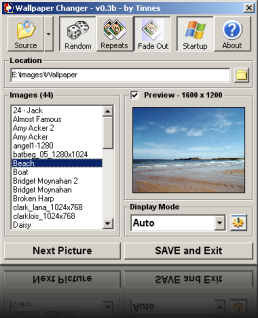 Images can be displayed either sequentially or at random and you can force all pictures to stick to a display mode e.g. Stretch, Center, Tile or the program can try and automatically choose which mode is best suited (with editable criteria). After changing the wallpaper, the program will then close meaning it won't be constantly running in the background using up system resources. BMP, JPG and GIF image files are all supported.